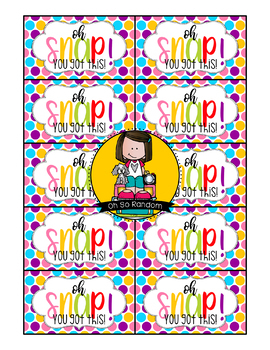 Testing Reward Treat Tag | Oh Snap! 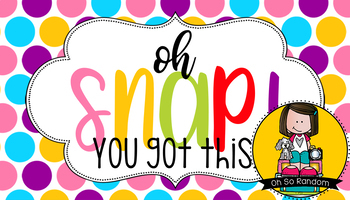 A treat tag is great for motivating test takers. This is a super cute tag for inexpensive treats! Can be printed in color or BW to minimize printing cost for those on a budget. Label Size: 2" x 3.5"
If you find this resource useful, please take a moment to leave feedback. Click the FOLLOW ME button to be notified when new products are added (and enjoy 50% off for the first 48 hours)! PRINTING TIP: This resource has been designed for printing on US letter size paper. In order for the contents of this unit to print correctly, select “shrink to printable area” or “print to fit page” (or a similar option). Purchase of this item entitles the purchaser the right to reproduce the pages for personal and classroom use. Duplication for other classes, an entire school or commercial purposes is strictly prohibited. Please be fair and don’t share!